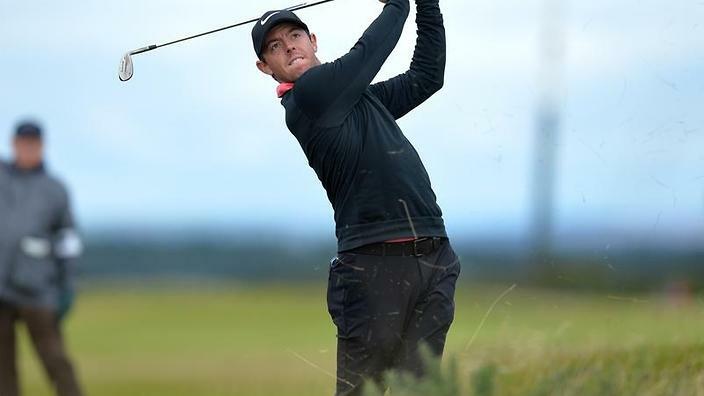 KINGSBARNS (UNITED KINGDOM) - Rory McIlroy has set himself three challenging career goals -- including becoming the best "international" player ever -- as he plots his comeback in 2018 following an injury-hit and trophyless year. The four-time Major champion, who has been dogged by a rib injury, finished in a disappointing tie for 63rd at the Alfred Dunhill Links Championship on Sunday, meaning a first season without a title since 2008. His immediate goal arrives at the Masters in April, when he will attempt to become only the sixth player to complete the career Grand Slam of all four Major titles. Also on his career list is overhauling Nick Faldo to become the most successful European golfer ever and -- perhaps most ambitious of all -- he wants to surpass South African great Gary Player's haul of nine Majors that make him the leading "international" golfer of all time. "The Grand Slam is the next reasonable goal on the agenda and then my goal is to become the best European Tour golfer ever and try and surpass Nick Faldo in that," said McIlroy, aiming to return to competition early in the New Year. "Then, and if had a career goal, it would be the best international golfer ever as Gary Player has nine Majors so I would like to think I can get close to that tally. "Clearly, the Americans have dominated the world of golf for the last 100 years with Jack Nicklaus and Tiger (Woods) and Walter Hagen and all those guys but the next big goal is winning the Masters for the Grand Slam and then becoming the best European ever." The Northern Irishman has won 13 European Tour titles but is still 17 wins shy of Nick Faldo's mark (Faldo won six Majors) and needs to win six more Majors to surpass Player. McIlroy, 28, has seen younger rivals such as Jordan Spieth, who has three Majors to his name -- steal the limelight since he won the 2014 PGA Championship. "I just feel with the experience I have now, I'm definitely a better player I feel than the player that won some of those tournaments and some of those Majors," said the world number six. "I see no reason why I can't better that in the next 10 years and that's why I feel like these three months are very important for me to put some really good things in place and step away and just reassess everything and reassess where I'm at and where I need to be. "Also, the landscape of the game has changed a bit since I started to win Majors. You've got young, hungry guys now that are fearless, basically, and they are playing the game how I basically came out and played a few years ago. "It's just about trying to gain an advantage here or there, so just reassessing everything and making sure I'm sort of not leaving any stone unturned and do everything I can to get back to the best player in the world." Rory McIlroy has set himself three challenging career goals -- including becoming the best "international" player ever -- as he plots his comeback in 2018 following an injury-hit and trophyless year.